1. Soften fabric: Create a ball of aluminum foil about the size of a baseball. Place it in your clothes dryer and with laundry. Use again and again. 2. Sharpen scissors: Layer foil and cut through the pile to sharpen your scissors. Six to eight layers of foil should do the trick. 3. Moisten brown sugar: Wrap a chunk of brown sugar in a sheet of aluminum foil and heat in a 300 degree oven for 5 minutes. 4. Iron fast: Place a sheet of aluminum foil under your ironing board cover to help transfer the heat to the items you are ironing and quicken your work. 5. 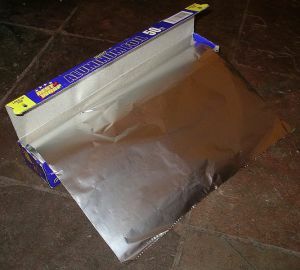 Increase radiator efficiency: Use heavy-duty aluminum foil, tape to cardboard with foil's shiny side facing out, and place behind a cast-iron radiator. Instead of being absorbed by the wall behind the radiator, the heat will reflect off the foil and move back into the room.